Activists wanted to put up pro-enlistment posters in Me'ah She'arim but someone took away their posters. 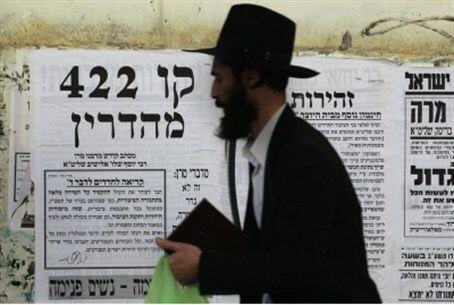 In Tirtzu, a grassroots Zionist organization, attempted to put up pro-enlistment posters in the hard-line hareidi Me'ah She'arim neighborhood of Jerusalem Wednesday night but were thwarted. The posters are designed in the style of the pashkvilim – posters that are commonly seen on the walls of Me'ah She'arim and other hard-line hareidi neighborhoods, and serve as a means of communicating announcements to the local populace. Im Tirtzu's posters feature Moses' admonition to the sons of Reuven and Gad, who asked to be exempted from liberating the Land of Canaan: "Shall your brothers go to war while you yourselves sit here?" (Numbers 32). However, the operation went sour. A few minutes after Im Tirtzu activists arrived in the neighborhood and began to put up posters, they discovered that someone had broken into their car and stole most of the posters they had printed. They left, mission unaccomplished. A resident of the neighborhood later explained to Arutz Sheva why he saw the operation as misguided. "It is unacceptable that Im Tirtzu activists who wish to influence the enlistment of hareidim would deliberately come to the most extremist place, Me'ah She'arim – a location whose residents traditionally do not take funds from the state, and are considered much more extreme than the rest of the city's neighborhoods." "If they want to have influence, let them go to Har Nof, to Bayit Vagan and the other mixed neighborhoods. Why here, of all places? It must be a wish to create a provocation." The project did not receive much coverage in the news media either, possibly because Im Tirtzu is perceived as being a nationalist group, whereas Israel's journalists are usually liberal-leftist. Im Tirtzu Chairman Ronen Shoval said: "We approach the hareidi sector in a positive manner and out of a sincere wish to create a dialogue that will lead to cooperation. We implore the hareidi populace to show responsibility toward the general population and to be a full partner in the physical existence of the Nation of Israel, besides its spiritual existence."